Little did we imagine a few years back that most of the works performed manually then would become automated. Thanks to the ever evolving technology! Man himself discovered and innovated technological means by which a work that previously took hours of manual labor, now can be done efficiently and rapidly without any physical exhaustion. Due to the business challenges brought about by consumers’ demands and the stifling competition from the rivals, the entrepreneurs have no other choice but to put their best foot forward. With the similar intention of giving a futuristic scanning solution to the people, Accura Technolabs, an R&D company based in Singapore has developed a revolutionary scanning app. The invention has gained popularity with diverse sectors of enterprises, one of which is banking and finance. Some of the ways in which Accurascan can considerably improve banking sector operations are enlisted below. Accurascan app is based on OCR technology. OCR or Optical Character Recognition technology extracts the text from an image captured by the device camera. Banks have loads of documentation and typing works throughout the day. The employees devote most of their time typing or looking for important papers which they lose quite often. Accurascan app scans bulk documents rapidly. So, instead of wasting time by typing or writing down customer details or taking out printouts of the same, install Accurascan on your mobile and scan with a tap. Being a paper-intensive work organization, bank employees frequently lose important documents due to disorganization. Apart from the time wasted on typing, another major amount of time is spent on finding the customers’ document printouts. Most of the physical spaces in banks are covered with piles of papers, stacks of files, registers or stand alone cupboards for storing document printouts. These spaces can otherwise be used for other important work like setting up of a help desk. 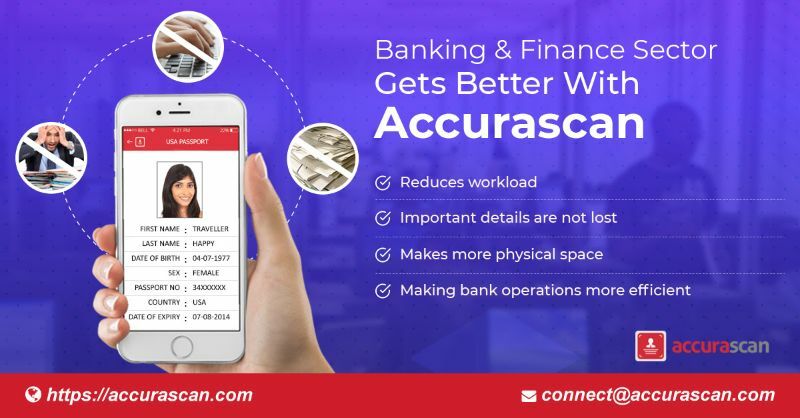 With the use of the Accurascan app that is compatible with both iOS and Android platforms, banks can eliminate the need for papers, files or registers. Thus, making it a neat and organized space. It also reduces the use of paper and its wastage which is an eco-friendly initiative too. There is no better way to please clients than to provide them with customized service. Being able to make customers feel special is a bonus point for any organization. Accurascan app has a web SDK/API which can be used to integrate with existing apps of the bank (if any) or the bank can enhance the features of the Accurascan app with it. The web SDK/API is tool kit for adding extra features or for customizing it as per the requirements. Thus, with this tool kit, the user can have a wide scope of a tailor-made app. While Accurascan can be customized with its web SDK/API, there is another app developed by Accura Technolabs which is SaaS-based and is a ready-to-use product. AccuraGo is compatible with iOS, Android and web platforms. Both AccuraGo and Accurascan, the document scanner apps can read Passports, Visas and ID cards at lightning speed. The demo version of Accurascan can be downloaded from either Google Play Store or App Store. It is free for a month after which the users can choose any paid package of their choice depending on their usage needs and enjoy seamless scanning like never before.